November is going to be a big month as there will be two eclipses (A solar eclipse in Scorpio and a lunar eclipse in Gemini). Additionally, the planet of Communications (Mercury) retrogrades in Sagittarius. November will be a month to remember for all signs, so let's take a look and see what is in store for you personally, Aries. The planet of love, Venus, begins the month in your 7th House of marriage from10/28 - 11/21. Expect to be the center of attention where love and romance occur. You could take an ongoing relationship to the next level and find yourself in a mood to seriously commit to a partner. 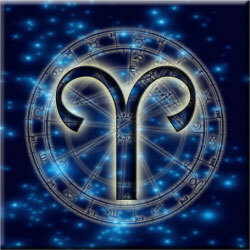 All Aries, single or coupled, could find themselves taking their love life a step further during this transit. Singles could meet someone new while couples take their romance to new heights. Love and romance are looking brighter with Venus in Libra for all Aries this month, single or coupled. Mercury (Communications) will retrograde between 11/6 -11/26 in the sign of Sagittarius. This is the last Mercury retrograde of 2012, Aries. Try to get important details out of the way before Mercury retrogrades. In other words: Take advantage of the first 6 days of November to get your personal and professional relationships exactly where you want or hope for them to be, Aries. Whenever Mercury retrogrades, it always a great rule to re-think, revise, rewrite or reorganize something. You get the hint, Aries. To learn even more about Mercury retrograde, click here. Your ruling planet - Mars (Sexuality/Energy) will be in the compatible sign of Sagittarius until 11/16. You notice you possess the physical energy and determination to get important affairs in order, personally and professionally. Expect a surge in your energy levels and don't be surprised if you find that your sexuality is more heightened than normal. You might have a strong desire to pick up and take off during this transit. If so, schedule your plans on either side of the Mercury retrograde. If this is not possible, double check your travel schedules and allow for some delays. It's not that you can't travel, Aries. It just is a good idea to expect some delays, miscommunications or frustrations with your best laid plans during Mercury retrograde. A Solar Eclipse and New Moon occur in the sign of Scorpio on 11/13. This eclipse will transit your 8th House. You might hear news or learn about your investments, be dealing with insurance issues or discover that a new beginning is needed in some area of your life dealing with the 8th House. To learn more about how eclipses, always look to the House that they fall in and the properties of that House. More often than not, something will occur in this area of your life. Typically, in Astrology, eclipses signal beginnings and endings. The 8th House represents rebirth, personal transformations and other mundane areas. This could be an intense day for you, Aries. At the end of the month, a Full Moon and a Lunar eclipse will fall in Gemini and your 3rd House of communications, neighbors and siblings. Issues from the past or dealings with siblings, neighbors and relatives can be volatile on this day. Take a step back before you react to events that occur around this time, Aries. It will be imperative that you control your temper or responses to others. To learn more about eclipses, what they represent and how they could influence your life, click here. The signs of Cancer, Capricorn and an Aquarius play important roles in your life this month, Aries.